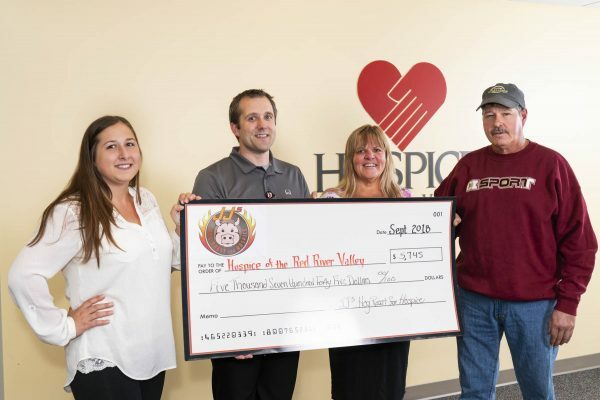 The third annual JJ’s Hog Roast for Hospice was held Aug. 24-25 and raised $5,745 for Hospice of the Red River Valley. The two-day event, which featured music, a car and bike show, and a traditional hog roast meal, was held near Pelican Rapids, Minn.
Over the past three years, the event has raised $11,381 to help provide hospice care to patients and families. Jeffrey “JJ” Bruns, Jr., died in 2015 at 28 years old because of an accidental death. His family wanted to memorialize his name in a special way that reminded them of JJ’s fun-loving personality. The event was sponsored by Blue Cross Blue Shield of North Dakota, Thrivent Financial, A1 Radiator Service, Cormorant Garagemahal, NorthStar Safety Inc., Northwest Auto Body Inc., Dewey’s Septic Services, Charlie & Sons Electric Inc., G-Loc Digital Photography, Pro Pallet, Rick’s Bar and Grill, Ihli’s Hardware, Robert A Saunders D.D.S., Sheyenne Saloon, Forum Communications and Printing, Roamers 4X4 Club, Doug’s Optical Inc., General Equipment & Supplies Inc. and Autowerks. Next year’s event is scheduled for Aug. 23-24, 2019.